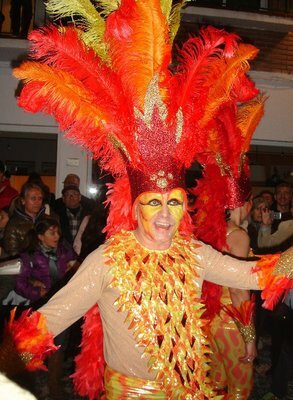 When a giant feather-bower-embellished willy drives past, you know that Sitges Carnival is finally in full swing. Spectators line the streets, packed against shop fronts donning inappropriate fancy dress, excitedly awaiting the big event. Suddenly soul-shuddering drums explode into blazing, palpitating rhythms and a grand display of the burlesque and the bizarre pulsates through the heart of the town. Radio-hogging tunes of the moment are blared out and clouded with tropical, salsa beats, and for a moment we forget that it’s winter and pretend that we are in a far off balmy destination grooving under exotic coconut trees. But alas, it’s cold and we make a mental note that next year our costume should be more weather appropriate. 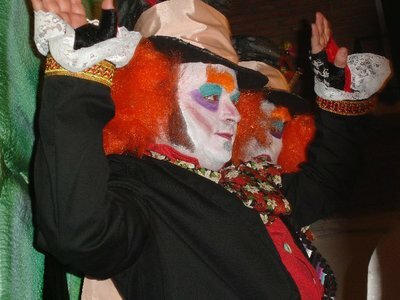 That will no doubt be forgotten though, as the exuberant fun and spirit of carnival will surely lead us astray. Eccentric and fantastic floats squeeze through the brimming and awkwardly narrow streets with flamboyant confidence and ease. Booming with vivaciousness they wobble at times with the insatiable party spirit of carnival-goers. Truly impressive artistic feats pass before our eyes with theatrical flourishes and thunderous energy, and house a multitude of striking, vociferous characters. Glittering, sensational, outlandish and lurid they dance the night away, posing for cameras and rousing the atmosphere. 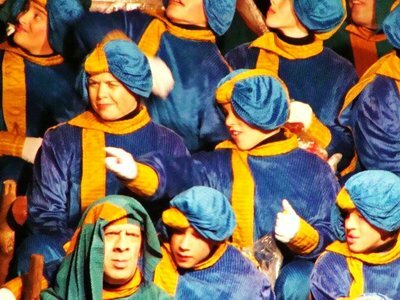 As we take in the extravagant, celebratory surroundings colourful costumes excite and delight and leave us wanting more, eager to see what else will make its way down the street… and you can bet your bottom dollar, it’ll be increasingly ridiculous and outlandish. Mermaids, Mad-Hatters, Freddy Mercurys or peacocks, who knows what you may behold – at Sitges Carnival, it would seem that anything goes! When the decorations are boxed up again and the January blues well and truly kicked in in many countries, festivities are still in full swing across Spain, with the highlight of the season still to come – the Feast of the Kings, or Los reyes magos, to many, more important than Christmas Day and traditionally the time for exchanging presents. 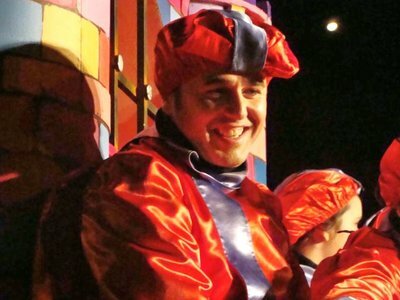 The eve of the 5th of January for Spanish children must be the most anticipated time of the whole year, where a magical parade of drama and spectacle, vivacious colours, and booming characters bring to life a century’s old tale in true flamboyant style. 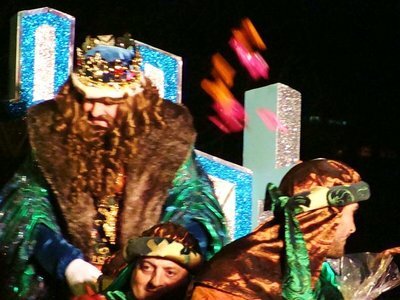 The spellbinding arrival of the gift-baring Three Kings to their town, accompanied by a dazzling entourage sometimes a thousand strong, must be overwhelmingly exciting for them, and provides a glittering and extravagant finale to the Christmas period. A buzz of activity hums through the air all day long in preparation for the evening’s festivities, and excitement bubbles away reaching boiling point at around 6pm. Friends and families great and small choose their place wisely as they line the streets to await the theatrical parade of the Kings, the children’s fizzing enthusiasm and intrigue by now uncontrollable. Suddenly, the faint murmur of a drum is heard in the distance harmonising with rumours that they are finally on their way. Gradually the beat grows stronger, slowly developing into a grandiose, regal rhythm, announcing that royalty is indeed approaching. Trumpets galore break into a flourishing fanfare, and from around the corner appear the forerunners to the kings’ infinite party. Richly robed choruses file by at a triumphant pace, the endless members acting out well their royal duties. Colourful messengers carry the Christmas letters written by the children of the town. Horse riders try their best to look majestic whilst controlling their vessels amidst the crowds of people. Brass bands, wind bands, and troupes of drummers keep the momentum going and rouse the festive spirit of all around. 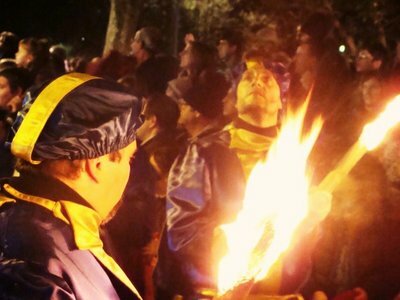 Flag bearers tell us of the exotic origins of the kings and flame jugglers delight and warm us as they pass by. 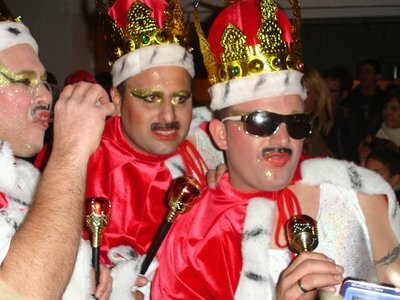 Soon the streets explode into a roar of excitement – the Kings are here! The hoards fervently cheer and applaud as the lively, glittering carriages approach, a true show on wheels. 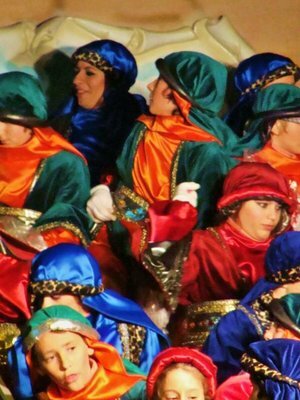 Their royal highnesses, Balthasar, Melchrior and Gaspar, wave to their fans like superstars showered in glory, embracing the emotion of their subjects with joyous, festive outcries. The locals go wild as the Kings hurl sweets into the air, stretching their finger tips up high to catch some or scrambling to the ground to scoop up any that escape them. Filling your pockets with as many as possible is a must. 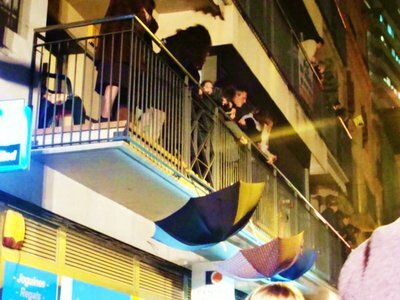 Some even go as far as hanging upside down umbrellas over their balconies for maximum sweet-catching potential. 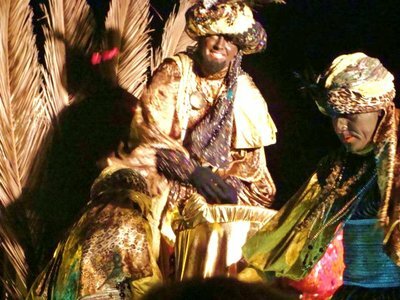 Los reyes magos is a truly magical evening where the whole town seem to come together to celebrate what for them is perhaps the most important part of Christmas. The awe-inspired look on children’s faces as the Kings float past is enough alone to create a wonderful atmosphere. But, the whole thing really is great fun for adults too, letting out the child in all of us. If there’s one thing Spain knows how to do well, it’s celebrate! 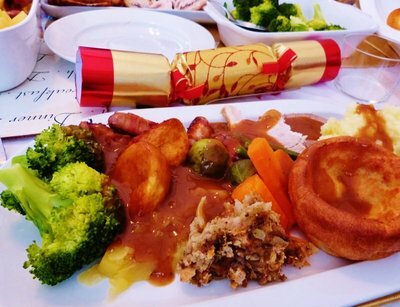 The Great British Christmas Dinner! Surely, one of the very best things about Britain. The suspense mounts for weeks for those of us living abroad. As soon as the tree goes up, dreams of a glistening roast embellished with perfectly rolled up pigs in blankets take over. M&S inspired images of tumbling roast potatoes, smooth, slow-trickling gravy and swirly-steamy veg play out in our minds, tantalising our tastebuds for days on end. And before we know it, the momentous occasion arrives. Christmas morning, and the rich aroma of slow roasting meat fills the house, providing a warming, wintry ambience and provoking a steel band of rumbles in our stomachs. We hover around the oven, hoping to catch a glimpse or a waft of what will be the flavoursome festive centrepiece. At some point your mother starts to panic about whether there’s enough veg, but you look around you in disbelief and confirm to her that the ten different varieties themselves would suffice for a Christmas dinner, let alone the turkey, the beef and the p’s & g’s that go with them! 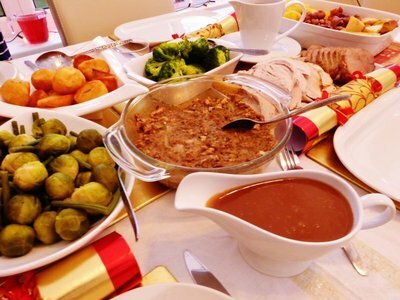 Soon the table fills up with delicious, piping hot mounds which together make up the colourful collage that is, Christmas dinner. Bright, cheery carrots mingle with bouncy, vivid green sprouts, and the wise, old broccoli stands apart, thinking himself king of the veg. Potatoes and parsnips harmonise, a choir of crispy, roasted goodness, whilst mash lays in a bowl by the side like a fluffy, creamy cloud. Peas chitter-chatter, rolling around like fools, and stuffing holds tight, fearing the crash of the impending spoon. And finally, swede sits bored, yawning in the corner, occasionally conversing with the lethargic Yorkshire puddings. Then, suddenly, the over door is flung open, and the prized showpieces carefully lifted, emerging from the steam like superstars. 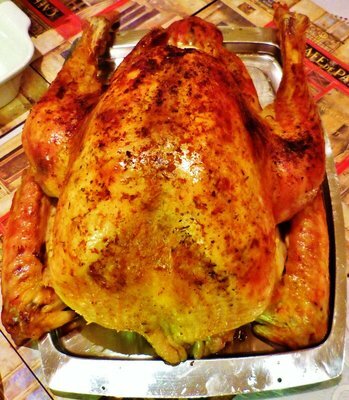 Next comes an important moment for any man during the festive season – the carving of the meat. Dad carefully finds the perfect angle and gracefully slices away to produce succulent, rounded pieces of turkey and beef. Picture perfect, and you just can’t resist, so you steal a little slice – just to test it, of course! And then the grand, long anticipated moment arrives, and you all sit down and finally get stuck in. Brilliant! And surely, one of the very best things about Britain! So I had visited Paris a couple of times before and done the classic tourist route of The Eiffel Tower, Louvre and Eurodisney. But I knew from the start that this trip was going to be different. With four friends now living in the French capital it was long time for a rendezvous – but this time I would be at a major advantage… staying in a proper Parisian flat, with people fluent in the language and who are totally and every so coolly in the know about the ins and outs of that vast cultural epicentre. So, in a rather pretentious manner, I told my hosts that I didn’t care about the Arc du Triomphe and Sacre Coeur, and that I wanted to do whatever they normally do. And so we did. And so I saw, a completely different city. 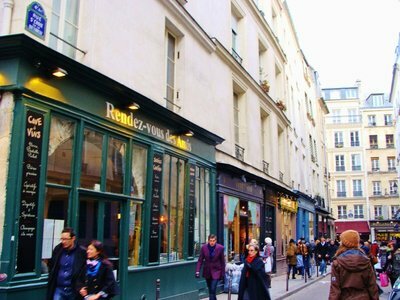 Scenes from a Paris that I didn’t even know existed were acted out before me, and enchanting visual spectacles along with numerous culinary delights filled my weekend with excitement. I emerged from the airport somewhere in the region of the second arrondissement and was greeted by an icy blast of harsh December wind shooting through the winding tunnels that make up the immensely labyrinthine underground world of the Paris metro. I headed towards the exit, fighting against the stinging chill in the air and ice covered steps and popped out somewhere that instantly looked fantastically Parisian. Creamy, weather beaten apartment blocks with an array of stores and restaurants nestled below them lined the streets in all directions. High above, long, rectangular windows embellished by iron railings looked out onto the bustling world below, and lonely glowing lanterns cast a movie-worthy hue on the frost-nipped pavements. I looked around me, inquisitively and delightedly taking in the distinctive ambience. But naturally, was quickly escorted to a bar for my first vin rouge of the weekend. I woke bleary eyed the next morning and was taken for breakfast on Boulevard de Bonne Nouvelle where I was greeted by a perfect buttery-melty croissant, freshly squeezed orange juice and café crème, which although were delicious, were seriously expensive, proving my suspicion that Paris is capable of breaking the bank regardless of whether you’re in a tourist trap or not. Next, we headed over to Rue de Rivoli for a browse around the shops, in particular the BHV department store – one of my friends’ favourite places. It was then suggested that we went for a spot of lunch in the area of Paris where she works on the outskirts of the city, so that I could see somewhere different and try an authentic locals in the know meal. So off we hopped to a place called Fontenay-aux-Roses, to the Braserie L’Odyssee, and sat in a squished corner on a tiny table surrounded by hungry French workers – brilliant! The menu du jour was extensive and baffling but thanks to my year 7 French I managed to decipher that cheesy onion soup and steak and chips with some kind of onion sauce (most things seemed to be based around onion) was indeed an option – and what a marvellous choice it turned out to be! A huge steaming bowl of comforting wintry goodness arrived as my starter and I tucked in with glee. The rich, rustic flavours of the soup were divine and the juicy breaded topping oozing with herby infusions. It really was perfect, and so, so filling! Next came the robust plate-devouring beef filet accompanied by a potent onion puree and a chaotic mountain of fries. The meal was simply delicious but unfortunately, given the quantity and the soup starter, unfinishable. However, I was most pleased to have dined out with the locals and sampled a truly authentic French lunch. Of course, we needed a good while for the feast to go down, but by late afternoon we had made our way to the Village de Noël, the ever so festive Christmas market boasted by the Champs-Elysee. 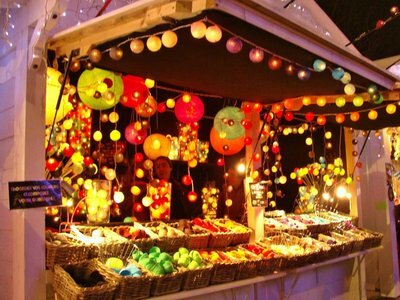 The market goes on for as far as the eye can see on both sides of the avenue and offers all of the usual yuletide goodies – mulled wine, hot cider, bratwurst, an endless array of glinting chocolates, and more decorations and gift ideas than one can handle in a single visit. The extent of the market is rather mind-boggling, easily rivalling the German effort, and with twinkling Christmas lights illuminating the sky, and the waft of hot festive treats swirling in the air this is surely one of the best ways to spend a shivery December’s eve. 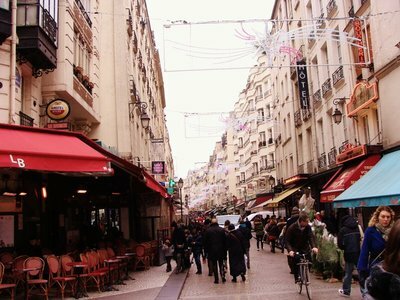 The next morning I was taken for breakfast and a stroll along Rue Montorgueil. 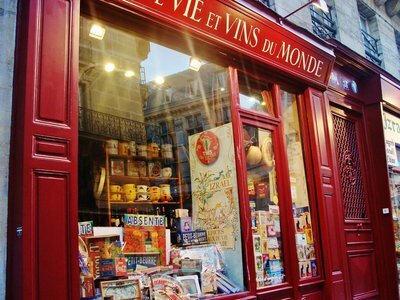 This lively street had a fantastically olde-worlde feel to it, like a kind of Oliver Twist ‘Who will buy this wonderful feeling’ scene with a Parisian twist. Cheese shops, wine shops, ham shops, and fish shops mingled with flower sellers, tailors and cute boutiques. Inviting cafes, no doubt with a thousand tales to tell, lined the pavements and customers sat out in the morning chill leisurely smoking and sipping away at their coffee. The street had a vibrant, aged ambience, suggesting that it hadn’t changed much in centuries and I truly hope that it stays that way as it remains one of the quaintest and most colourful places I have seen in the city. 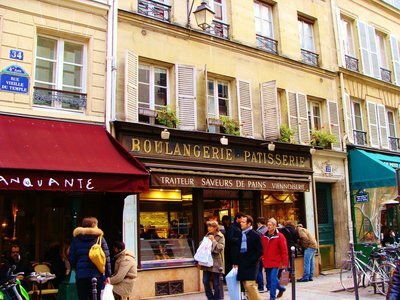 Soon it was lunch time and we headed over to Rue Saint-André des Arts, in Paris’s Latin Quarter. One of my friends knew of a special crepe restaurant and was eager for me to experience it. Creperie des Arts, as it was named, was a charming and amusing restaurant set out in a cave-like style with curious art work and rustic lighting. Tables were housed in stone booths giving the impression of dining in toasty caverns. Indeed, the interior was most peculiar and provided a quirky lunchtime treat. 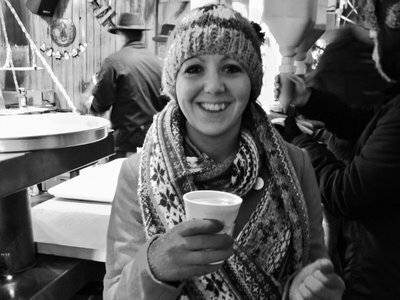 As for the food, there were abundant crepes on offer, both sweet and savoury, and typical Breton drinks such as sweet cider to wash them down. All in all a great time was had! Next, it was off to Le Marais, which I was fervently informed was one of the coolest areas of Paris. And of course my knowledgeable hosts were right! Le Marais was none other than amazing. With a strong Jewish influence the narrow streets were buzzing with history. Alluring display windows intrigued and contented me and small cafeterias beckoned me to pop in for a warm. Vivid shop fronts and richly colourful awnings enchanted me at every turn whilst elegant squares whispered tales of the artists and aristocrats of times gone by. Chic is the rule for everything on sale along with the occasional flirting with the vintage, and on every corner is an opportunity to take the perfect black and white photo of the perfect Parisian scene. The final thrill of my weekend was to be a raclette party (apparently a typically French winter affair) and since I had no idea what a raclette was I was eager to see what it entailed. Cheese, and lots of it – that’s basically what it’s all about. 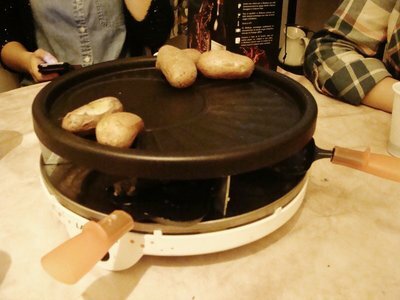 Melting cheese on mini spades under a specially designed table grill then tipping it over potatoes and ham – those French are genius! The problem I discovered was that it is very easy to get carried away. You hear yourself saying ‘oh go on then... just one more slice’ time and time again until eventually, you can’t move. No regrets though, it really was a truly memorable way of ending my weekend in Paris and something that I shall certainly be repeating in the not so distant future! And so I discovered that weekend, that as wonderful as the famous landmarks are, they are merely the beginning. The Eiffel Tower is astounding no doubt, but there is so much more beneath the surface of the city, so much to see, to do, to taste – it really is worthwhile making a friend in Paris!